Copyright 1998 Jacquelyn Paull This is one of the recent fantasy carousel animals. This series is of carousel animals which are enjoying themselves in fantasy settings. 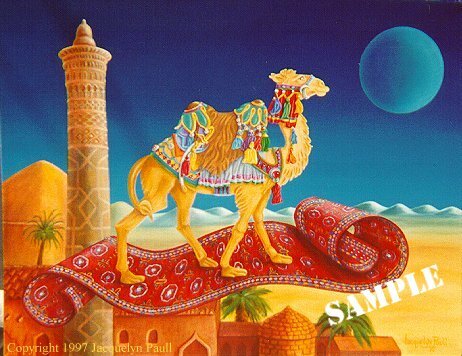 Bokhara, a wise but adventurous camel, is taking a magic carpet ride over the rooftops, going only he knows where. A book about Bokhara has just been finished and I am in the process of illustrating it. 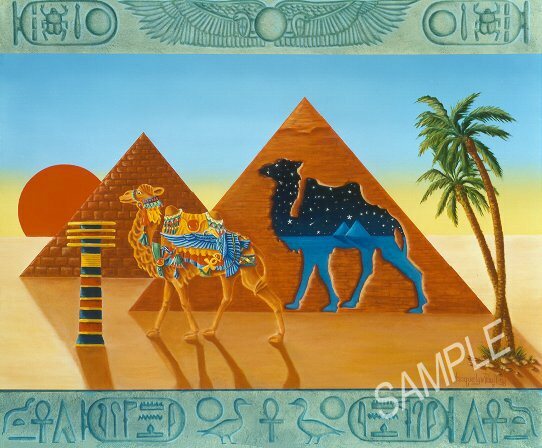 Of course the cover image is our intrepid camel taking a riden on his flying carpet. A female bactrian camel, named Isis, walks through symbols of the eternal. Maybe she will meet Bokhara on his magic carpet one day. Make a child happy! Buy a kid's T-shirt with both these images!